As usual, there will be a special limited first edition to be released on the same day as the regular one. 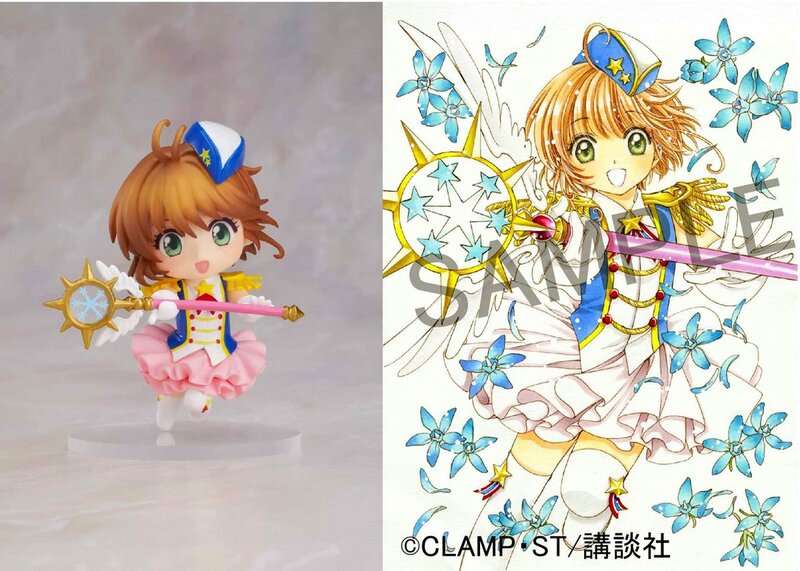 The special edition will come with a Sakura Nendoroid based on the cover illustration, as seen above. Pricing for the special edition has yet to be revealed. I loved that cover art and what a cute bonus for the special edition! It feels like a long wait for this release, though, almost 3 months of waiting. The bonus is SO ADORABLE this time around! This is a Nendoroid Petite if I’m not mistaken: the Nendoroid Petite series are smaller figures, about 65mm in height each. I don’t own any Nendo Petite, but as far as I can tell, unlike the Nendoroid series, they can’t be “taken apart”, they don’t have parts that can be changed, the figure is ‘as is’. Leaving that aside, I really wonder how CLAMP feels in situations like these? Actually, I should be wondering what CLAMP feels about ALL the countless goods out there too hehe? I was surprised with this bonus! Nendoroids are usually expensive, right? I don’t understand much about them. I hope it won’t be too expensive — I am thinking it will be as much as the OAD version. Right! But the logo at the bottom will most likely cover her legs. Yeah~! Just like the OAD version. It was announced waaaay before the release date, which was also in September. This is a Nendoroid Petite if I’m not mistaken: the Nendoroid Petite series are smaller figures, about 65mm in height each. Oh I see! So it won’t cost as much as the default Nendoroid. Thanks also for the info about not being possible to move the pieces around. I guess it makes sense. But indeed this is SUCH a cute bonus. I’m so excited for this! I’ve been in nendoroid hell for a while now and having a CCS nendos resurfacing is such good news! Yes, nendoroid petit are smaller and have less posability, but they can be taken apart and be mixed and matched with other nendoroid petits. Though some faceplates and hair won’t work depending on the year it was manufactured and the mold of the character’s face. So you CAN change parts around? Thanks for the info! Personally, I would have liked that her skirt stayed white like in the illustration, but I’m just glad we’re getting something. It’s a little too pink, isn’t it?